While on a Killer Whale watching tour off Northern Vancouver Island in British Columbia in Canada two whales play games amongst the kelp. A large male Killer Whale surfaces as he rolls and plays games in the kelp floating on the surface of the water off Northern Vancouver Island in British Columbia, Canada. 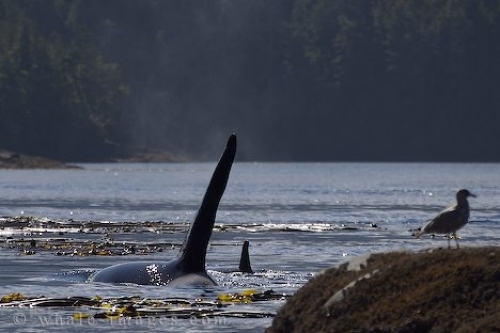 You can see the tip of the dorsal fin of another Killer Whale as she enjoys the kelp games. If a Killer Whale is in the right mood, they will venture close to the shore where many kelp beds lay and then the games begin. Here they will wrap kelp around their dorsal fin and tail fluke as they roll in and out of the kelp. Photo of two Killer Whales playing games in the kelp along the shoreline off Northern Vancouver Island on a whale watching tour. As these two whales enjoy their games, a seagull perches upon the rocky shoreline minding his own business. These Killer Whales are members of the Northern Resident Clan and are known only to eat fish, preferably salmon. If these were Transient Killer Whales, this seagull might not be brave enough to hang around as Transients usually feed on seals, dolphins, other whales and have been known to feast on seabirds. Northern Vancouver Island in British Columbia, Canada is one of the most spectacular places to view Killer Whale families. On some trips you are lucky enough to see a vast amount of different behaviors of an Orca such as breaching, vocalizing, feeding, spy hopping or playing games amongst the kelp beds.